Welcome to Misty Meadows Market Inc. Located in the village of Conn, 15mins north of Arthur & 10mins east of Mount Forest. You will discover a quaint little country market busrting with a large variety of fresh fruits & vegetables in season, and year round home baking, groceries, crafts & gifts . Our Vegetables are locally grown. If they cannot be purchased locally, they are sourced from Elmira Produce Auction Co-op. Niagara Fruits are sold in season. We source our meats and cheeses from local abattoir's. We sell Earlidale, NS Martin & West Macton summer sausage. We stock Pine River, Black Diamond, Balderson & St. Albert Cheese. Check out our rhythm, wall & mantle clocks, which sing hymns & gospel songs. Our China giftware is produced locally. Come by for your next gift! 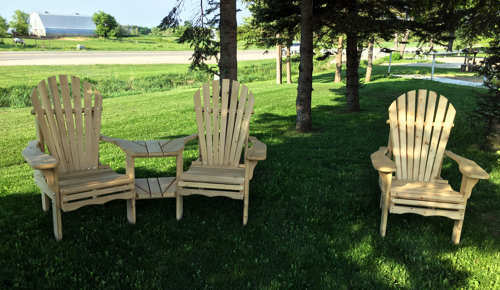 See our line of hand-crafted outdoor Adirondack and Muskoka furniture. Fashioned from North American white cedar, our furniture is ideal for Summer relaxation, entertaining and family get-togethers. Fresh Baked daily on site choose from six flavours of butter tarts! Annual All-Day Pancake Breakfast on Saturday, April 7, 2018. By Donation - Proceeds to Christian Aid Ministries. Event runs from 8:00 am - 5.00 pm, Call US for more details. Services - Lots of vendors on site, refreshments, deals & discounts.